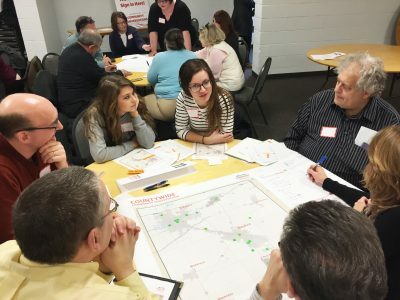 The Vibrant Communities process was initiated to engage the communities of Elkhart County in a discussion on quality-of-place. Over a six-month program, nearly a thousand participants shared close to 4,000 unique ideas and comments. To reach a final set of community quality-of-place actions the Vibrant Communities Steering Committee developed a six-month process to elicit thoughts and ideas from the public. This included several large and small in-person meetings, online feedback and physical surveys. Please review the Action Agenda below and let the Steering Committee know what you think! C1 – Exhibit countywide ownership and pride. The community has to begin thinking beyond the small municipal boundaries and find strength in ownership of the larger county and region. Strong allegiances to hometowns are not diminished by laying claim to the assets of the entire county. This is an attitude that is beginning to be replaced by an appreciation of a more macro-community perspective. C2 – Improve communication between organizations, local governments and other community sectors. Good routine communication is fundamental. A community that plans together and talks across municipal lines is more efficient and productive. Elkhart County should resolve to strive for better communication among multiple disciplines, up and down hierarchies, through formal and informal contexts. C3 – Maintain an entrepreneurial and organizational leadership training ecosystem. The county will strive to train or support existing and emerging leaders by exposing them to current resources, organizations, meeting/networking protocol and by appointing them to positions of responsibility. The program will collaborate with countywide training and leadership opportunities and encourage entrepreneurial activity. C4 – Strategize and improve countywide broadband. Elkhart County needs a distinct and thorough broadband inventory and strategy. Little is known about availability and capacity throughout the area. There are parts of the county where the internet is frustratingly slow or unreliable. The County has an interest in making high level broadband available to all of its citizens. It also has the capacity to extend fiber and wireless to under-served areas in the CR 17 corridor and beyond. C5 – Activate a multimodal loop countywide, and connect regionally. 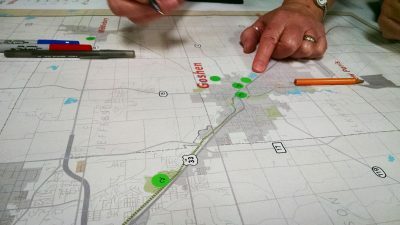 Construct or designate a multi-trail loop that connects the cities of Elkhart and Goshen and the towns of Middlebury and Bristol, and that takes in scenic views of the St. Joe and Little Elkhart rivers. The other assets that this plan would tie together are five parks, the Pumpkinvine Nature Trail and the Elkhart Civic Plaza. This has been measured at approximately 40 miles, with a goal to ultimately include 200 miles of other marked trails. C6 – Improve regulatory efficiency in granting building and other development permits. The county’s communities will work toward a 7-10 business day review and approval for issuance of commercial/industrial permits. C7 – Establish a 2.5 acre riverside park. The County Road 17 boat launch area should become a true riverfront attraction with its own comprehensive plan that connects it to an entire blueway network. C8 – Help meet demand for single family homes in the $130-250k range. Of the total homes sought, 65 percent lie in the $130-250 range, with a very tight market demonstrated by quick turnover at above-list. The rental market is characterized as “lightning” or very low availability with 3.2 percent vacancy in 2015. C9 – Build the RV Capital Event Center and Rally Facility. Create the RV Capital Event Center and Rally Facility at the existing site of the RV Hall of Fame. This would be accomplished through leveraging the existing facilities of the RV Hall of Fame, developing significantly expanded multi-use event space, creating the infrastructure to host 500-1,000 unit RV rally camping, and encouraging supportive hospitality developments. C10 – Establish a countywide innovation strategy. This initiative could have many individual and countywide manifestations, but primarily start with a broad scan of the current innovation sectors and build upon them. Innovation parks can be supported with the highest level of broadband and other infrastructure. Other aspirations can benefit from the resources of the Economic Development Corporation (EDC), Chambers and local government. There are some tax incentives the EDC can negotiate for on behalf of innovative companies. This countywide framework can also strategize toward new sectors and markets. C11 – Evaluate and improve workforce readiness. One significant step toward diversifying the local economy will be “skilling up” the local workforce. For years Elkhart County has lagged the state in the percentage of individuals with post-secondary certificates, and 2-year or 4-year degrees. The most promising practice for changing this situation is building “Early College High Schools” (ECHS) into our local education system, delivering certificates and degrees to many more students. One part of ECHS is the “Polytech Model” which focuses on one industry partner and the skills employees need for success in that industry. C12 – Develop proactive strategies to respond to a cyclical marketplace. To mitigate, to the degree possible, the preventable effects of the inevitable downturns in the local economy and its industrial sectors. Mobilize the various business resource agencies (EDC, Chambers, ISBDC, etc.) to monitor the economic climate and provide assistance quickly. For example, add action items to respond to findings of the Goshen Chamber’s Sound of the Economy series. C13 – Cultivate adaptable and transferable expertise. In the age of Google, the focus in talent development has changed from needing to memorize facts to knowing how to access information quickly via technology. Additionally, the “Four C’s” have become highly valued by employers (AKA “collaboration, communication, creativity and critical thinking”), and these Four C’s transfer to every job sector. Finally, creating a Pathways System across the county allows students to focus their education on a certain career area, become employed, and then continue pursuing the education that is appropriate for their career development over their lifetime. C14 – Evaluate community entryways. Some of the highest traffic spots coming into the county and municipalities are clusters of aging manufacturing and deteriorating buildings. The worst is widely identified as the old US 33 corridor from Osceola into the City of Elkhart, along the Norfolk Southern Rail Yard. Other entries that take in tired building stock are underwhelming at best, from all directions. What should entries say about Elkhart County? Public art and well maintained, sustainable landscaping can also signal the uniqueness and identity for each community. C15 – Build Ox Bow Lodge and Natural Interpretive and Recreation Center. Create a new Natural Interpretive and Recreation Center that includes full service lodging accommodations on county owned property adjacent to Ox Bow Park. An overnight lodging/retreat center that could include facilities for County Park staff to offer unique interpretive programming, and the proximity of Ox Bow Park to the Maple-Heart Trail and the Elkhart River provide for recreational activities for overnight guests. C16 – Evaluate local event/calendar resources and promote the most helpful. Identify or create a countywide community calendar of things to do for residents and visitors, and meet a goal of wide distribution, awareness and use. This will foster event promotion expertise throughout the not-for-profit sector. C17 – Create satellite museum and interpretive exhibits. The Elkhart County community has several high quality museums, but most are confined to self-contained locations. The potential exists to create and display satellite museum exhibits at venues throughout the county. These exhibits could rotate seasonally and greatly increase the local profile of area museums. This initiative would position Elkhart County’s cultural landscape favorably against neighboring St. Joseph County’s cultural landscape, which appears to be more effectively coordinated and promoted. C18 – Promote the use of local foods and native plantings. This is a broad initiative to increase public pride and awareness in native plants and locally grown or produced foods. By encouraging the use of ornamental native plants instead of exotics, the Elkhart County community can be leaders in sustainable landscaping. Furthermore, the use and celebration of locally grown and produced foods will increase local pride, health, and understanding of sustainable food practices. Make Elkhart County known for its public and private gardens, enthusiasts and events. C19 – Convene an Elkhart County Arts Alliance. A coordinating arts coalition to promote cooperation and collaboration among artists, musicians, arts organizations, music organizations and arts-serving venues in Elkhart County. This coalition would serve to strengthen the arts scene, promote and establish more arts programming and to “cross-pollinate” (e.g. encourage the installation of a Goshen Clay Arts Guild show in Elkhart; offer “sneak preview” performances of upcoming Jazz Fest talent in Goshen). The Arts Alliance would also promote arts education for children and adults by working to establish a greater number and variety of affordable art classes for children and adults. This organization would secure funding from the Indiana Arts Council, National Endowment for the Arts, Bloomberg Foundation and other arts funding sources to raise the visibility of — and access to — arts in the public domain. Lastly, this group would be the planning authority for development and installation of public art projects (both temporary and permanent) throughout the county. Initial focus: City of Elkhart, then other areas of the county. C20 – Create a marketing initiative that promotes the waterways. The community has rarely marketed the rivers as a form of recreation. These waterways are used by the people who live on them but not as a form of recreation or something to visit. There is a great opportunity to create new blue connections, adding to the list of recreational amenities and promote the beauty of the county through the rivers. C21 – Identify resources to improve curb appeal from Main Street to Main Street. Unlock resources to identify and eliminate blight and beautify central corridors in every community from Millersburg to Elkhart. C22 – Improve the perception of education. Improve the perception of education by teaching sense of community and service, maintaining high academic standards and encouraging lifelong learning. C23 – Develop a central online hub of community-building resources via social media. A central online hub for community-building resources would provide one place to go to find out what is happening in a community, allow event organizers a space to market upcoming events, and share content from past gatherings through video and pictures. C24 – Integrate and celebrate demographic diversity in all events possible. Now that you’ve had a chance to review the Action Agenda, let us know what you think. What do you support? What are your concerns? Let us know below. Is there a particular proposal where you feel like you could be helpful? Let us know and get involved in the implementation of the Action Agenda.